Three helicopter pilots are the first ever to graduate with the UK’s only airline-supported BSc (Hons) Professional Aviation (Helicopter) Pilot Practice degree, delivered in partnership between Helicentre Aviation Ltd and Middlesex University London. The helicopter graduates – Barry Wilmott, Russell Sheriff and Andrew Thompson – are the only students in the UK to graduate with this degree which is unique to Middlesex University, and designed specifically for helicopter pilots. 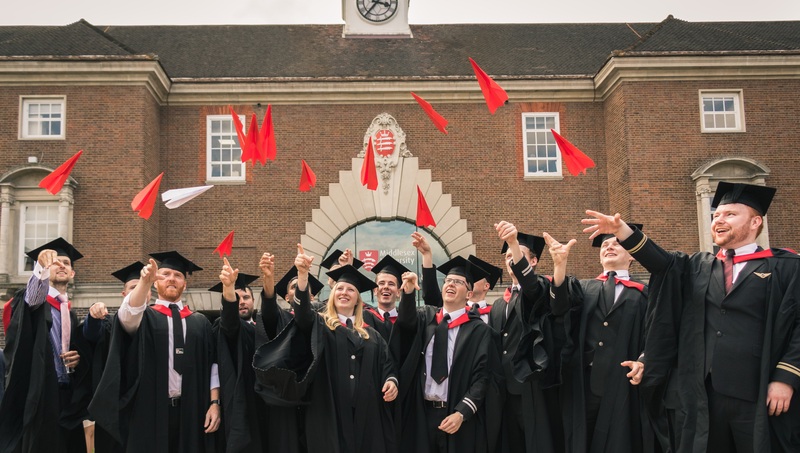 Also graduating are 16 airline pilots, 15 of whom graduated with BSc (Hons) Professional Aviation Pilot Practice degrees delivered by a partnership between easyJet, L3 Commercial Training Solutions (L3), and Middlesex University London. The easyJet graduates – Regan Hawthorn, Luke Elsworth, Tom Slingsby, Tom Walker, Sam Jarman, Oliver Walton, Isabel Thompson, Dan Delaney, Alistair Hatcher, Sam Williams, Adam Hanley, Dilpeche Ramgi, Ryan Clyde, Jamie Smart and Joe Millard – represent the second group of easyJet pilots in the UK to graduate with this unique degree, and are the first students on the MPL (Multi Pilot Licence) route to achieve their licence alongside the degree. The day of firsts culminated with the graduation of Kieran Grimes, a pilot who graduated through a cadet programme delivered by Virgin Atlantic, L3 and the University. Kieran represents the first Virgin Atlantic cadet to graduate on this course, and fittingly he passed his BSc (Hons) Professional Aviation Pilot Practice with First Class honours. Professor Tim Blackman, Vice-Chancellor at Middlesex University London said: “I’m very proud of all our pilots whose graduation is the result of a lot of personal effort and commitment to the aviation industry, an industry that needs graduates of this calibre to meet ever increasing skills needs. EasyJet graduate, Isabel Thompson, 22, from Bermuda said: “I wanted to do a degree and I wanted to learn to fly. My peers on the course decided on flying much earlier than me, from childhood. But for me, I was around 15/16 taking a flight and the captain was female. I was invited to the cockpit and she really encouraged to follow my dream and that’s what I’ve done." Middlesex University London is now looking forward to the new academic year where it will continue its programmes with EasyJet, Virgin Atlantic, L3 and Helicentre Aviation, and will continue to build similar agreements with L3 and other aviation industry leaders.